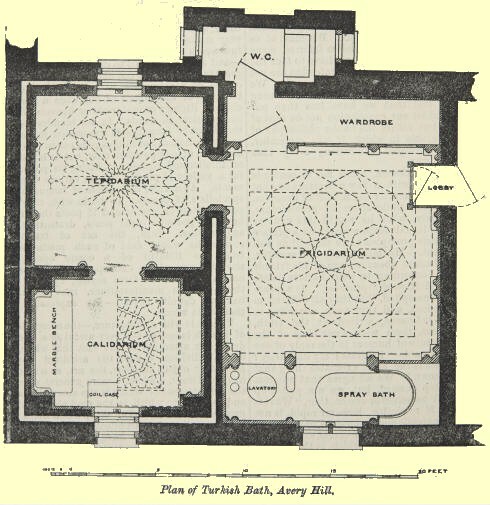 There are two known plans of the Turkish bath at Avery Hill. The more accurate one (the upper of the two plans below) is probably that included in the article in The Builder published on 26 Nov 1892. 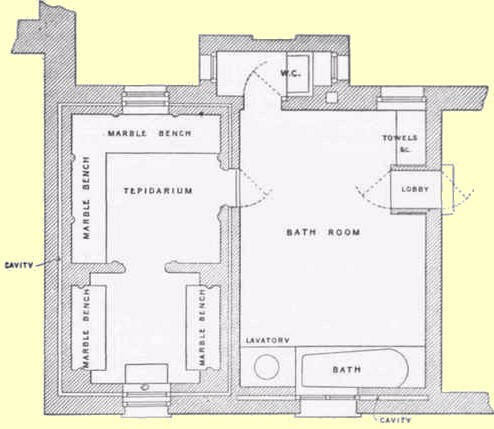 The second plan, which is from a multi-volume work on the construction of houses published at the end of the century, does not completely match the description of the bath. Here, the room described as the frigidarium is labelled 'Bath Room', though it is correctly shown leading directly, as one would expect, into the tepidarium. And the room described as the caldarium is unlabelled here, though again, it is correctly shown, as one would expect, leading off the tepidarium.